The Alien: Covenant sets will look “battered, like the original Star Wars…” according to Michael Fassbender. Are we returning to a lived in aesthetic as seen in Alien with the Nostromo? One of the issues fans had with Ridley Scott’s last foray into the Alien universe was that the Prometheus didn’t share the “lived in” look to its sets that the Alien films did. It sounds like the Covenant will have seen more use and abuse than the Prometheus did. Something we’re sure fans will be pleased to hear. Thanks to Andrew Todd for the news! They executed it well, but can you imagine how out of place that would have looked I in any of the other 4 alien films? Remember that moment Aliens where they're looking over the schematics? Funny how old-school those schematics and that whole device are already and it's only 2017..
That was the best part of the movie, lol! In 3D it looked spectacular! Easily one of my favourite visual scenes in the entire series. Just out of the sheer majesty and beauty of it. I think that was probably the single most intrusive thing in terms of technology. Ok the Prometheus ship was modern, but the art direction was fantastic and the sets f**king real. It was refreshing while not betraying the spirit of the saga. The only useless thing is hologram. Fassbender is very excited by this new project! as a kid! dafuq? That was the best part of the movie, lol! In 3D it looked spectacular! What process? Of using black goo? Yeah. It is a process. It certainly didn't do Fifield Rocklover any favors, but Fassy might just be able to endure it, because, well, he's an android, and doesn't have a soul; perhaps the latter element, thought slightly tongue-in-cheek, could mean he's unable to be corrupted like reprobate men are, symbolically-speaking. I think its an interesting thing to explore - the black goo's affects on an android - i just think it needs to be part of something larger and based ok the images leaked today, if it happens it would be part of somethjng larger. Well, in some of the Rage War novels, you have Alien organic devices modifying entire ships, so who knows what the goo is capable of? I was going to say that we don't know if the goo would have any effect on David as Fire and Stone comics consider it some sort of genetic accelerant, in which case it wouldn't have any effect on David but then I remembered Ridley has no obligation to staying with that. Though, considering the comics had to be reworked because of what they were doing with Prometheus 2 would mean that they might have a decent inkling of Scott's intent so perhaps that will be consistent. Regardless, I really can't wait to see just what design they come up with for David's new body. I really hope it's a really visually piece of Engineer engineering. If he's a synthetic, maybe he could survive the process and Shaw doesn't? Maybe he uses the black goo to fuse his head with Shaw's body. I'm increasingly getting this sinking feeling that David will create the Aliens.. Interesting, I thought all the sets looked top-notch and believable. It looked like a brand new pristine ship on its maiden voyage imo. Totaly agree. I also like that they are going to mix old with new in Covenant. It was already more than 2 years old by the time we see it. But my issue isn't about it looking like a new ship. It's about it looking like a movie set. Well, two years old with nobody on it active other than a robot who doesn't need to even go to the bathroom theoretically should result in the ship looking exactly as it did when it took off. I don't understand how you think the ship would have weathered at all in 2 years time when everyone on it was sleeping. I like Kubrick's 2001 Odyssey and movies with intriguing themes. I think that movie like Covenant could have all the necessery atmosheres and frightening monsters, but at the same time it could also tell a bigger story. Bigger story does not need to include some bombastic actions and epic answers, it simply needs to imply that there is even more to Xeno than perfect organism and bioweapon... What? I have trillions ideas I hope those three writers wrote something new and original!!! I dont expect biology/ archaeology essay, whats the point of that? Ridley already promised that all the references he intend to make in Covenant will not be direct at all...Subtle yet recognizable to those who like depth. (his words!). great theme to explore. He could serve as a contrast to Xeno creature!!! I didn't mind Prometheus design at all, even though I was very attached to the original retro look. What worries me with each Ridley Scott film is the story. He has strong visual, both in mis en scène and artistic design. Always had top noch VFX & SFX for all his film I think. But the story of most of his recent films are so full of void, I think he never managed to get something out after American Gangster, which I hate to say because the doode made Blade Runner, Alien, Gladiator, Kingdhom of Heaven and American Gangster which are films I love. I can't blame him though, he was always one of this director who always tried something new, which is something I love about him. He just needs a good script and the way things are being made and windowed by major today probably makes it impossible for him to get above average. I think it was an error for him to come back to the Alien universe. Prometheus should have been as far away as possible from it. I would rather see a new directors (I don't like Neil Blomdkamp but I think he's necessary in restarting the old machine) so after Fox has chased the money they could give it to more independent filmakers who don't have an appétit for huge epic drama / action thing. There are many smart ways to implement Aliens in the verse without having to tell all the big picture about space jockey / weyland and all that stuff that just dismiss everything in the plot because they take so much space for so little things. I think Alien Isolation could have been a perfect script. It's short and it focuses on the atmosphere and the tension rather than the big themes and the mysteries (which frankly, fans care for but never made it into a good film, just see AVP, AVP-R and Prometheus where they tried to spend time on telling what the creatures are rather than telling the story itself). You get answers relative to the story but not all the ultimate answer. I can't see the first alien movie with 2 hours of exploration in the derelict learning everything + two hours studying the creature. It makes no sense, it's an horror movie, not an archaeology / biology essay with some biblical paraphrase (I think Fincher managed that last one better, it's only good when it's subtle, whatever it is, sexuality, religious references, biology, historical facts/beliefs). This is very curious. I wonder if it means we will see old tech like in Alien or just worn-out tech. I get the impression that this will not be an advanced scientific expedition who go to the planet on purpose, but rather a bunch of space truckers who accidentally find it. It never bothered me really for the reasons already mentioned, being Weylands ship and all. I actually don't mind them updating the tech of this universe as long as it still looks run down and grungy. Agreed. Makes perfect sense. What would have ticked me off, is if this Colony-ship wasn't somewhere in between. So this is good news. Makes me think Scott may be more aware than people were unforgiving, after Prometheus. I think it will be interesting to see the mythology surrounding colonizing explored in the series, more than before. I'm wondering, with the explosion of the ship on shore that we already know about, if this film won't somehow revolve around them being marooned and unable to leave the planet. Or if the bulk of it doesn't occur while they are trying to repair the ship. Kind of like in Alien when they are just trying to get off LV426. In colonizing Mars, we talk a lot about the crew making a one way trip. Like - they only have what they need to get there but not to leave. That could be an interesting angle to play up as well. David also says he is different. It made me wonder whether he will be wearing one of those Engineer bio-suits. Well I do believe it was the maiden voyage of the prometheus, so it was a newly constructed ship. "Fassbender is in Sydney, where he's filming Ridley Scott's Alien: Covenant, the sci-fi sequel to Prometheus. He's a big wrap for Scott's huge physical sets, which he describes as mixing cutting-edge NASA-like technology with "an old-school element where things look battered, like the original Star Wars..."
Strange that he would say, "like the original Star Wars" when he could just have said "like the original Alien". But I suppose it comes down to the same thing really. The weathering on the Nostromo was really amazing. The torn and worn seats on the bridge, the scratch and scuff marks on the suits, the worn clothing etc. It gave it a real-world believability that Prometheus' pristine sets often lacked. There were actually times in Prometheus when it felt that you were really just looking at a newly constructed movie set. So good to hear that grunge is back. The reason that is always bandied around about the difference in design is that the Prometheus was a state of the line research vessel. It also turned out to have the CEO of the company on board so I can buy into the general aesthetic difference. It was one of the things that people thought made it stand out - and not in a good way - from Alien. So Covenant already have four pluses! + Xeno and all the monsters! The big mystery is of course story and screenplay! Three writers, and three is a lucky number! I love the sound of that. No more state-of-the-art research ship like the Prometheus but the look of something that was once state of the art but has been given some use and abuse. I'm sure that will make a lot of fans happy. He also spoke a teeny bit about David: "And he loves playing the creepy AI synthetic, David. "He is creepy," he grins, like that's a good thing. 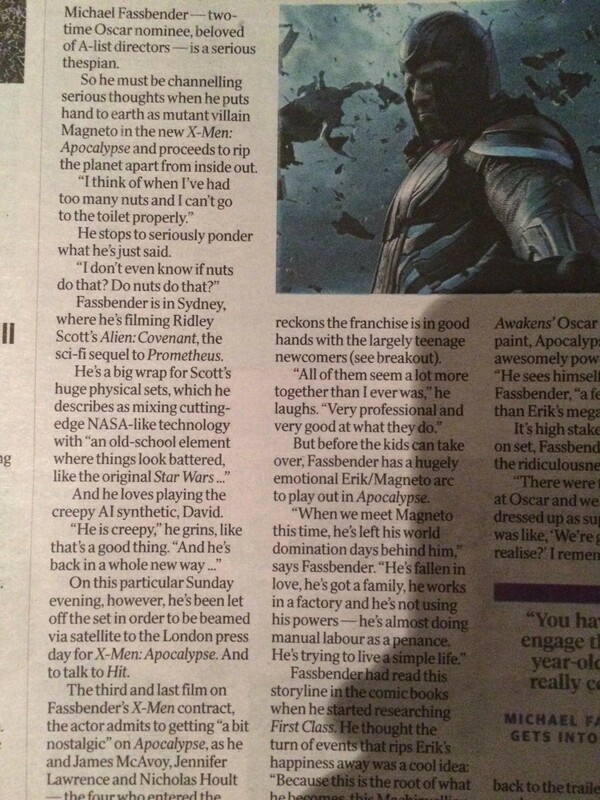 "And he's back in a whole new way..."
He also mentions that Ridley Scott hadn't been able to decide between filming in Australia or Canada but Fassbender had insisted on Australia. I'll post up some pictures in a second.